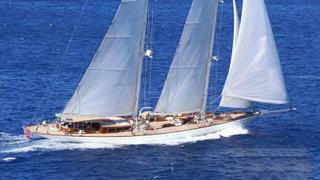 The 46.9 metre sailing yacht Zenith has been listed for sale by Haas International. Designed by Dykstra Naval Architects, Zenith was built in steel to RINA class by Turkish yard Ada Yacht Works and delivered in 2013 as a performance schooner. Accommodation is for up to 10 guests in four cabins configured as a full beam master suite, VIP suite and two twins, each with a Pullman berth. All guest cabins have entertainment centres, Samsung LED television screens and en suite shower facilities while a further three cabins sleep up to six crewmembers aboard this yacht for sale. Conceived to win races, she also evokes a bygone era with a handcrafted interior in solid wood panelling and furniture, contrasted with cream ceilings and sophisticated lighting. Zenith also offers a spacious main saloon with comfortable seating and dining facilities along with a sophisticated entertainment centre including a 55-inch Samsung television screen and a Bose Lifestyle stereo surround sound system. Other features include a large pilothouse saloon, a roomy divided cockpit and a conveniently sheltered deckhouse. Her elegant lines and classic detailing also ensure that she is a welcome sight at all the large classic yacht regattas around the world. Under power, a 650hp Yanmar diesel engine allows a cruising speed of 11 knots, topping out at 12 knots. Lying in Bodrum, Turkey, Zenith is asking €5,500,000.